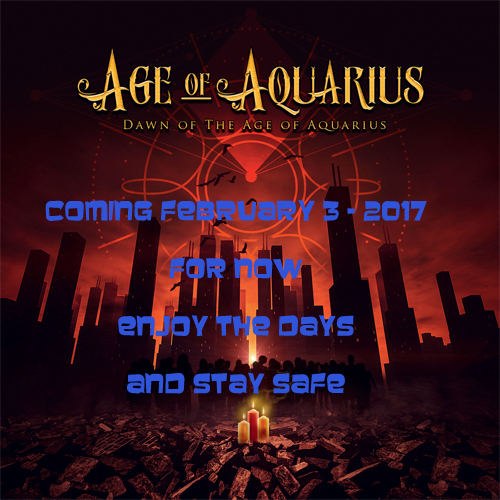 The Age Of Aquarius, what is the Age Of Aquarius and when does it begin or has it already begun? There is no definitive answer to this question but this is the theme to Peter Cox and Zoe Ehinger’s album “Dawn of the Age of Aquarius”. 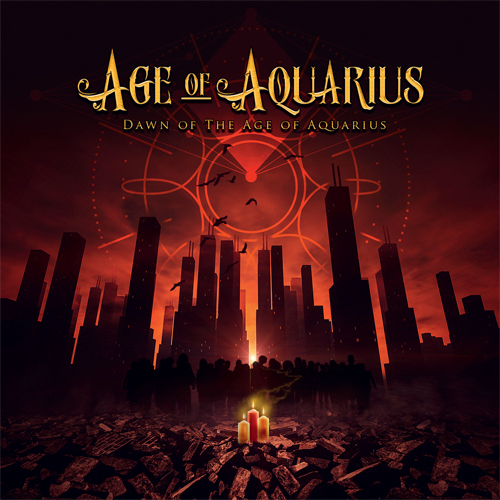 The duo call themselves Age of Aquarius and are qualified to talk on the subject as anyone as this is their star sign. The music ranges from rock to progressive rock with music written by Peter and vocals and lyrics by Zoe. Even though there is a sense of fear and uncertainty for our future the album is not all doom and gloom, in fact there are some real rockers especially Peter’s instrumental tracks and there’s moments of humour on the track “Saturnian Chaos” and the upbeat, infectious “Darling Jupiter” add to that very attractive artwork packaging and you have an album that doesn’t copy the well-worn rock album influences. Just like the times we live in the album is full of twists and turns and uncertainties. Maybe this is the beginning of the Age Of Aquarius after all !! There are albums that hit immediately, in the positive, others unfortunately destined not to leave the mark, at least for the writers, as in the case of the Age Of Aquarius. Band unknown by my undersigned, discovered just now by virtue of the review of this new Dawn Of The Age Of Aquarius. The genre proposed by this group formed essentially by a duo that sees Peter Cox on all the instruments and Zoe Ehinger in his voice, is inspired by a kind of light rock with almost pop-ambient grafts, with a look at some sort of almost relaxing. A sound universe difficult to compare with some other rock band. Certainly to be assimilated, this work requires a lot of listening, at least for those who do not find it all day before this kind of sounds. By the way, it is not as bad as work, but you have to have the right predisposition perhaps to accept songs that you can listen to at first and do not like right away. There are tracks that are appreciated as Darlin Jupiter, with guitars being read but with the right rock mood. Or you could point to The Seventh Hymn, which tracks a bit more the rocky road of our favorite music. One exception to this is the very beautiful and varied Saturnian Chaos song, which in some frantic recalls the Deep Purple, but only one song of this magnitude is not enough to lift it all up. A can be defined as a classic pop song with rock guitars. Obviously then there are songs that could safely be omitted from this record as the initial Under One Big Sky, resulting in lack of any sordid and passing immediately into the forgetfulness. However, you have to appreciate and praise the band’s choice of songs with such an album, certainly courageous on their part. They obviously love what they do, even at the cost of not having fun at all. This is always good anyway. Recommended only and exclusively to fans of this genre. One World Music Radio have published a podcast about our album! In the next podcast you can hear Zoe and me talk about the album and gain some insights in what it is all about. So just hit play. Entering the Rock Chart at #3! 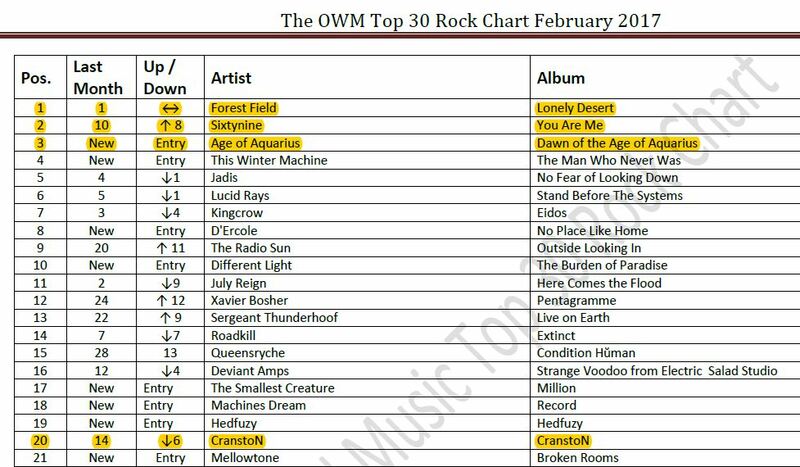 turns out our album entered the February Rock top 30 chart on One World Music at number 3. AMAZING!! thanks to presenters and listeners #Happy!! How cool is this: our track Darling Jupiter has been selected as “Limbo-tick” on LOES FM #Radio! Which means it will play once every 2 hours during the day for the coming month! Check it at http://www.nederlandseradio.nl/loes-fm/#close-popup or on www.shoutcast.com. Thanks to LazyRocker.com; Marc Schneiders and Raymond Coonen! 1. Go to http://rockcompany.nl/product-category/cd/. It is not only priced as a sale, but the webshop gives you a 17% discount with coupon 2017. But hurry, that is for a limited time! 2. Go to https://ageofaquarius.bandcamp.com/releases. Catch the song Darling Jupiter while you’re there. Copyright © 2016 -2019. All Rights Reserved.